Cookies for Breakfast? You betcha! We've tried these and love them. We're sure you will too! 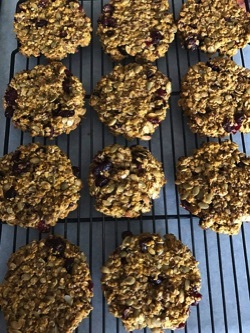 3) In large bowl combine oats, cranberries, pumpkin seeds, pumpkin spice and salt. Add in pumpkin puree, egg and coconut/honey mixture. Yummy Healthy Recipes For Your Enjoyment! Lunch always seems like the hardest meal to plan if you're on the go. Here is your solution. Make enough for the week and you're all set! 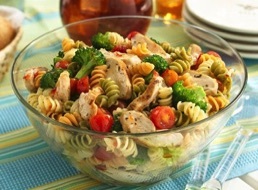 4 Combine 3 oz chicken breast, 1 cup pasta, 1/3 cup chopped broccoli, 1/4 cup chopped bell pepper, 2 tbsp sun dried tomato and 2 tbsp dressing. This can be prepared the night before or for the entire week at once and stored in an air tight container in the fridge. If prepared in advance, wait until morning of to add Italian dressing. Real food (no gimmicks or supplements), great coaching support from other Fit5 members. Lets get started today!